Terrafirma is not like other insurance companies. It is a nonprofit, specifically created by and for land trusts. While a typical car insurance company would raise premium rates following a claim, Terrafirma does not. You can file a claim and give timely notice as soon as an issue begins without worrying about the price of your insurance going up. For a refresher on when to file a claim, click here. Part of effective risk management is planning ahead to make sure you’ll be able to cover all of your expenses—legal and organizational. That’s why we want to make sure that everyone knows about the new overtime rules that will go into effect on December 1, 2016. Most employees earning under $47,500 will be entitled to overtime compensation. See the Department of Labor’s special overview and guidance for nonprofit organizations. The National Council of Nonprofits also published special guidance: Overtime Regulations and the Impact on Nonprofits. Nonprofits with budget years ending on June 30 will need to develop new budgets for the fiscal year beginning in two weeks that take these new changes into account. Nonprofits with budget years ending on December 31 have more time to adjust and plan for 2017. Most experts assess that tax exempts don’t have much to fret about, but if you do fundraising across state lines please pay extra attention as this may apply to you. Board members and staff don’t always agree — especially in the nonprofit world where passion and idealism can turn ordinary meetings into potential conflict. To help navigate choppy waters, the Land Trust Alliance is offering a complimentary webinar today at 3 p.m. Eastern on Directors and Officers insurance, as well as many other types of insurance, to help you plan for conflict and missteps that can lead to a full-fledged lawsuit. To sign up, please send us an email. Have questions? Please let us know. You can email us directly or call 202-800-2219 for Lorri, 202-800-2248 for myself or 802-262-6051 for Leslie. P.S. Terrafirma’s Annual Meeting took place in Burlington, Vermont on May 4th and was productive and successful! Pictured below: the hardworking volunteer committee members who devote their time and skill to making Terrafirma work for all 493 of its member land trusts. Does your land trust have written policies and procedures for dealing with an encroachment violation? Here is just one example of an action step that your organization can take: Ask neighbors to be your eyes. They can be your most valuable witnesses for up-to-date, firsthand information. For eight more tips on documenting, responding and more, click here. Still have questions about handling an encroachment, or anything else? Please let us know. You can email us directly or call 202-800-2219 for Lorri, 202-800-2248 for myself or 802-262-6051 for Leslie. 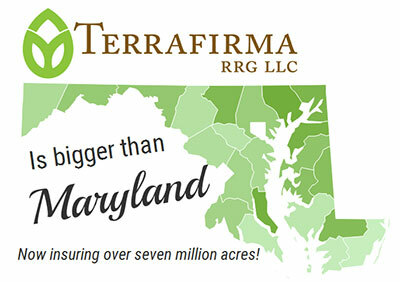 Terrafirma now has 493 members, operates in 48 states plus D.C., and insures over 7.6 million acres. That’s bigger than the state of Maryland! Thank you to all of the owner members of Terrafirma for growing stronger each year. The numbers are in: Check out the financials page to see this year’s annual report, financial statement and 990. Make sure your conservation success is a part of the Land Trust Alliance's 2015 National Land Trust Census! The survey closes on March 31. More than facts or figures, this survey shows the collective impact of land conservation across the country and is featured in prominent national media outlets. Hungry for more TerraBites? Check out our LinkedIn. If you have questions about updating your application or anything else, please let us know. You can email us directly or call 202-800-2219 for Lorri, 202-800-2248 for myself or 802-262-6051 for Leslie. The 2015 Terrafirma policy period ends at midnight, March 1, 2016. However, the policy allows members a last chance to submit claims for issues that started in the 2015 policy period. From March 1 to April 30, 2016 (60 days) you will have the option to file under your 2015 policy (for claims that started before March 1) or under your 2016 policy (for brand spanking new claims). This means that you have options. To file a claim for 2015, go to your welcome screen and click “View 2015 Application.” From there, select “File a Claim” from the menu on the left side of your screen. We’re here to help! If you have questions about the grace period or anything else, please let us know. You can email us directly or call 202-800-2219 for Lorri, 202-800-2248 for myself or 802-262-6051 for Leslie. P.S. The IRS announced that as of February 29, organizations who file Form 990-N electronic submissions must file forms on the IRS website (IRS.gov) instead of the Urban Institute's website. Form 990-N only applies to charities with net annual receipts of less than $50,000. Make sure you list all of your parcels when updating your Terrafirma application! Anything left out of the category of legal interests (easement, land, trail) you insure might not be eligible for coverage of a later claim. And because Terrafirma requires that you insure all of your parcels within the categories you select, your claim could be jeopardized if the parcel is missing. Double-check and compare to your database! Worried that you forgot something? Email help@terrafirma.org and we will help you update your application, even if you have already submitted (prior to February 2, 2016). P.S. It is not too late to secure a 2016 Risk Management discount! This can be done via webinar or our free and quick online course. To qualify, training must be completed every year by a member of senior leadership. The holidays are a time of giving and sharing, but not all giving and sharing is good. Many conservation easements prohibit subdivision — so a generous landowner who decides to give the back lot to a relative may be violating the easement. And since Terrafirma insurance divides parcels by number of owners, the division would affect your coverage. If you discover a subdivision, don’t hesitate to file a claim or placeholder claim. The situation may be simple to resolve but why take the risk? Filing a claim is easy! We’re here to help! If you have any questions about property divisions or anything else, please let us know. You can email us directly or call 202-800-2219 for Lorri, 202-800-2248 for myself or 802-262-6051 for Leslie. Do you want to start managing your organization’s risk, but you’re not sure where to turn? You have many free resources available! A Guide to Risk Management for Land Trusts is a quick, fun course that lets you easily customize a plan for your land trust. The Legal Defense Reserves Calculator gauges minimum legal reserves. The Conservation Defense Clearinghouse houses a collection of helpful documents. Log on as an affiliate using these instructions for free and discounted risk and insurance resources. Reminder: You still need resources to hire experts (see reserve calculator) and it is smart to get a preapproval from your board to spend up to the $5000 deductible on disputed violations and trespass and challenges. We’re here to help! If you have any questions about risk management resources or anything else, please let us know. You can email us directly or call 202-800-2219 for Lorri, 202-800-2248 for Hannah, or 802-262-6051 for Leslie. Working with a land trust, you will encounter all sorts of landowners and neighbors and others. Some will be more engaging than others. How can you be most effective with someone who isn’t as skillful or poised as you? Stay calm. If you feel yourself getting angry or upset, step back mentally from the situation, take a breath and remember what you want to accomplish. Your kindness and calmness can refocus the tone of the situation. Be clear. Subtleties of words can lead to confusion. Emotional finesse however is essential. Stay aware of consequences. If done calmly and clearly and without rancor, stating the direct consequences of the individual’s actions may be enough to lead to collaboration. Give it a rest. Diplomacy is critical. Come back another day to revisit the conversation. Remember you are the pro! Demonstrate your compassion, confidence and determination in all you do.